Posted on 05/17/2018 05/19/2018 by Desert Dweller | David C.
Forgetting the token umbrella in my car, safe inside the parking garage, the 90 percent rain chance was destiny! But that’s okay. 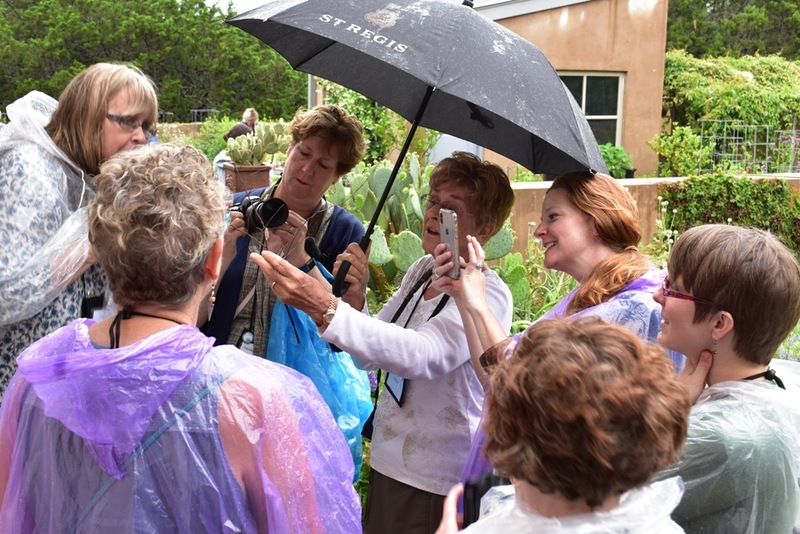 On to the first day of the garden tour. 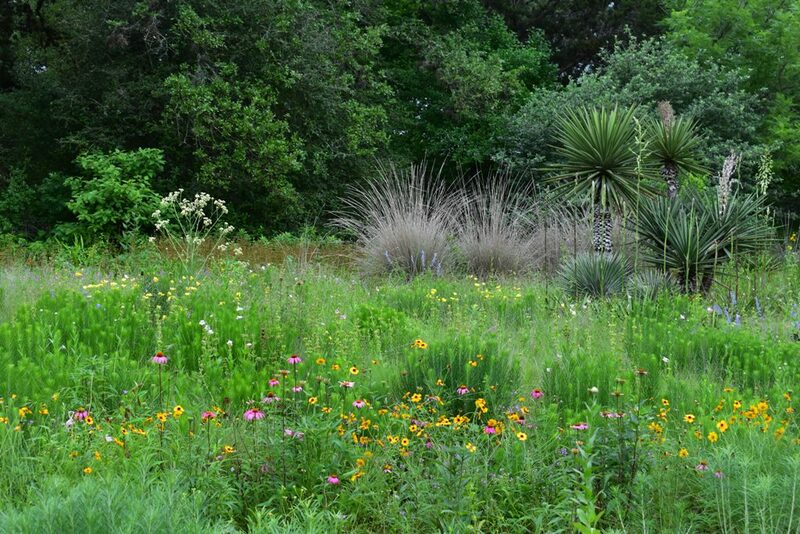 The Wildflower Center is where the weather hit the proverbial fan. 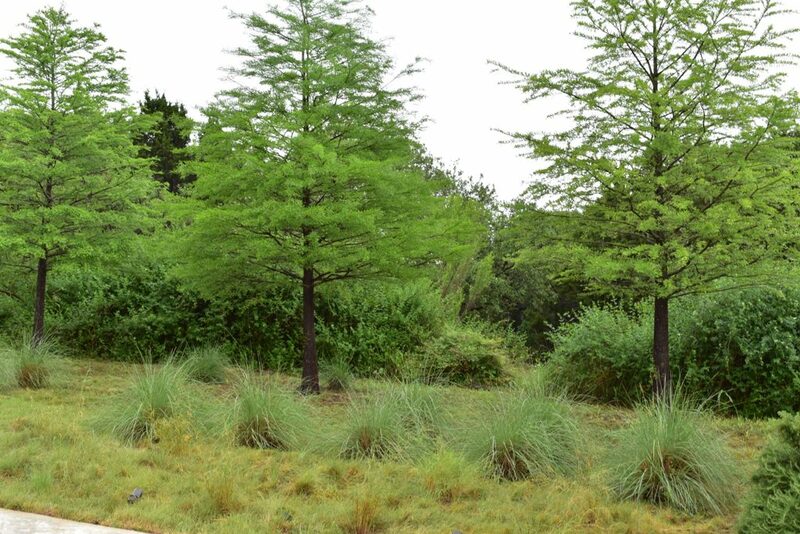 So many spots there are magical, especially with their sub-humid climate version of juniper savannah, adding in oaks and completed with a heavier atmosphere. Spikes of native Yucca treculeana, prairie wildflowers such as Echinacea purpurea and Coreopsis spp., and ponchos for the ensuing rain. 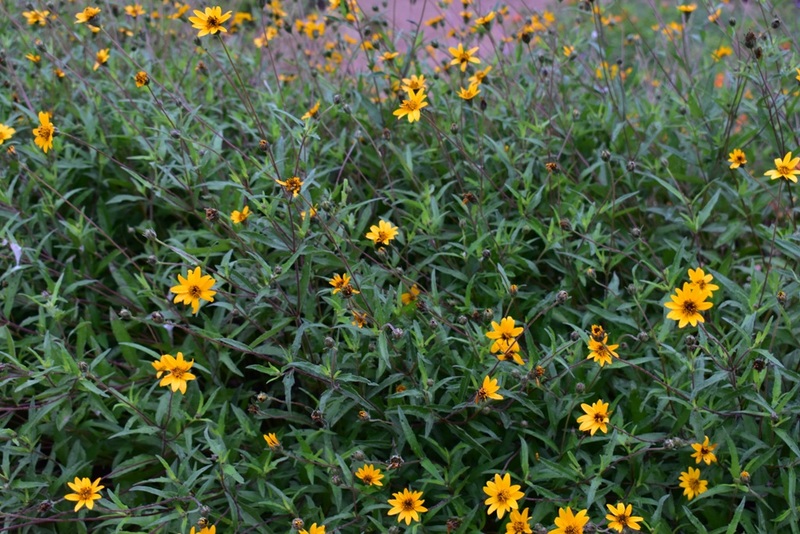 Wedelia texana, as the lightning and thunder suddenly began to crash. Diana’s Garden was very comfortable to enjoy inside her living room, and so gracious. A nice break from the kind of decor I’m around. 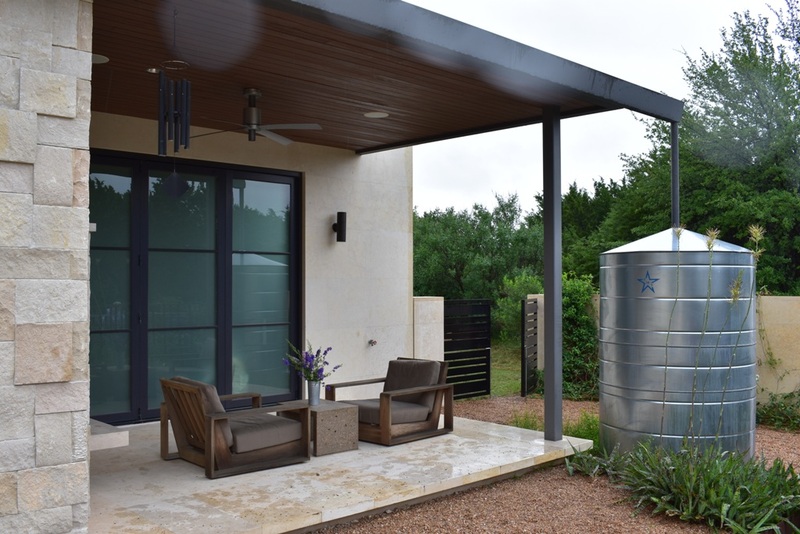 Though you can’t hold me back from going outside… Her rustic pool pavilion was so appealing, implying Robert Earl Keen playing Gringo Honeymoon as I swim off a BBQ dinner. But my photo looked more like a water-induced blur. So, use your imagination on that area. Looks like one of my favorite palms, Butia capitata / Jelly Palm. 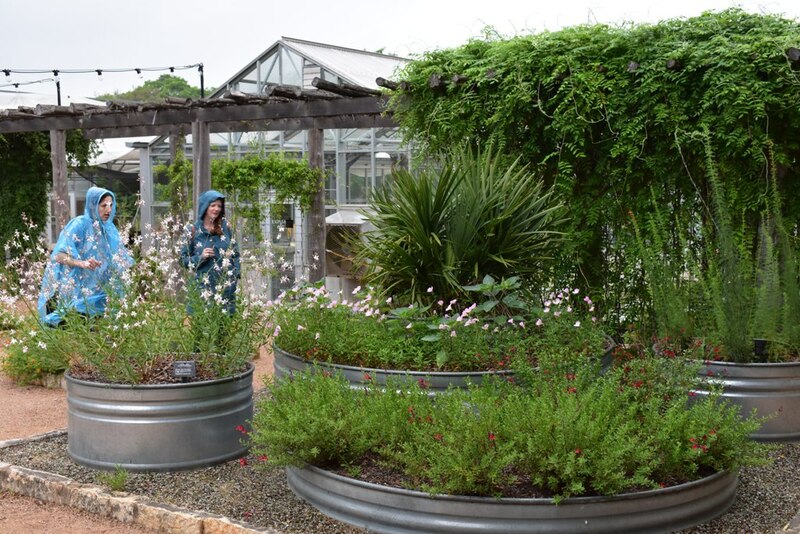 I skipped photos at The Natural Gardener, instead struggling to be comfortable post-cold front wearing shorts and forgetting my long sleeve tees (a packing faux-pas). Over lunch we enjoyed another of John Dromgoole’s inspirational talks, as I have before in other venues. So laid back and matter-of-fact, he spoke of how things can and did happen, but in a different place and time than I know. 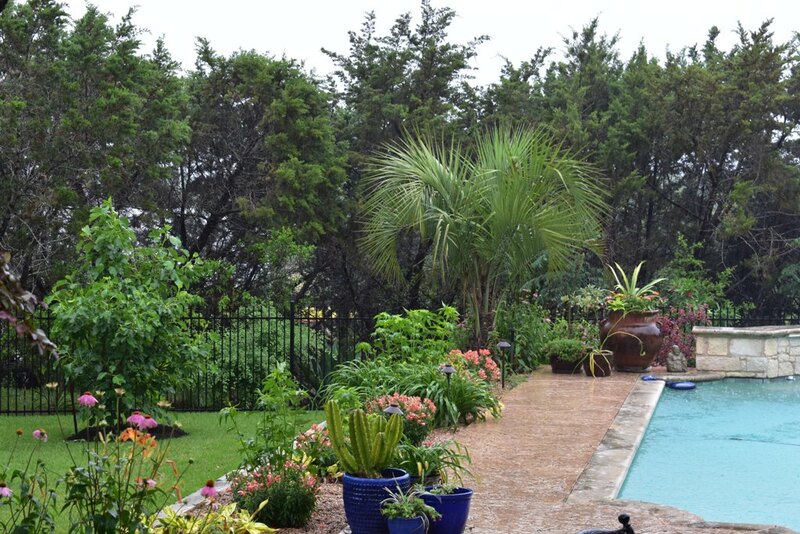 Rock Rose was more floriferous than ever, and the rain slowed to light but persistent showers. It hit me that owners Jenny and David might be as Loree as Loree is, at least in some of their multiple spaces with so many potted plants and details pulled together in unity! 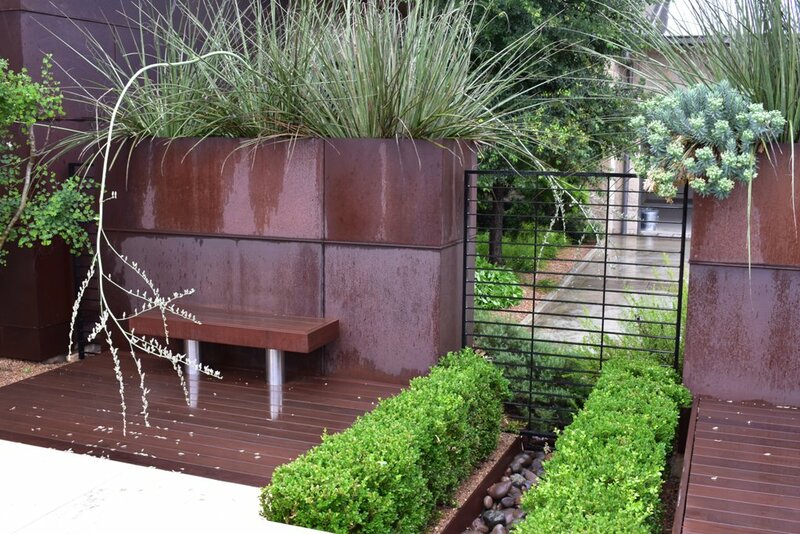 This planter box and bench provide yet another location to pause in all their garden spaces – I forget Jenny’s name for it. Here I almost feel like I’m in sub-tropical Asia with variegated Pittosporum and a Trachycarpus palm. And now I’m somewhere in Mexico, drying out in my mind! Everyone peering at Jenny’s find – an emerging insect! On my previous trip to Rock Rose in 2011, I took numerous photos and even did a post or two of it on my former blog, so I didn’t feel too pressured to capture more this visit. I could have taught a college semester course on Rock Rose, alone. I’ll need to re-visit those photos, and possibly post on this blog. 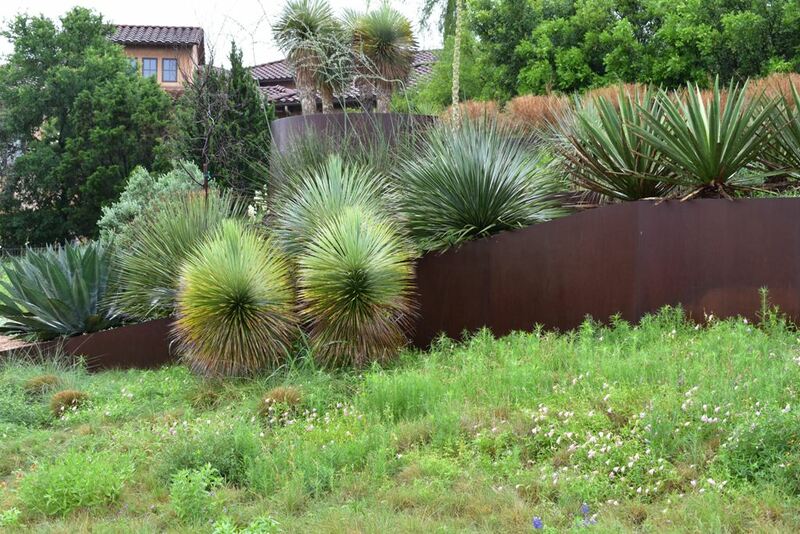 Ordinary (in Austin) cor-ten and spiky plants here were given an extraordinary treatment. 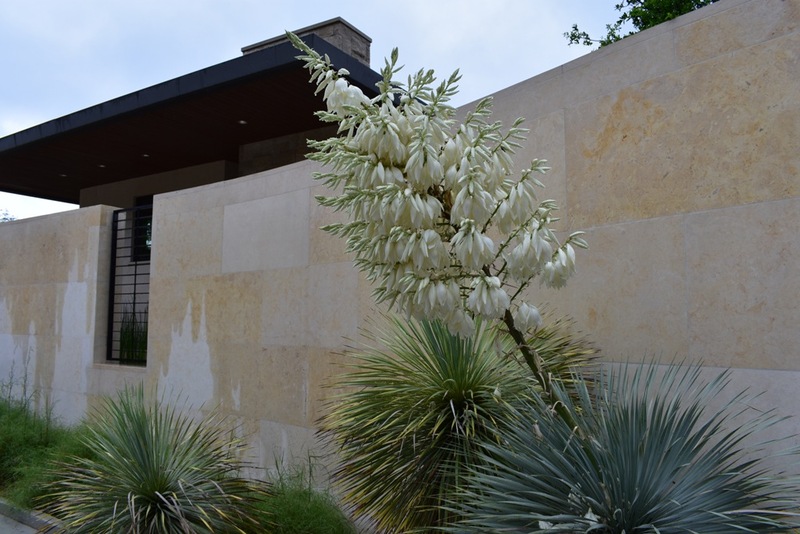 Higher Yucca rostrata low and lower Hesperaloe funifera high. 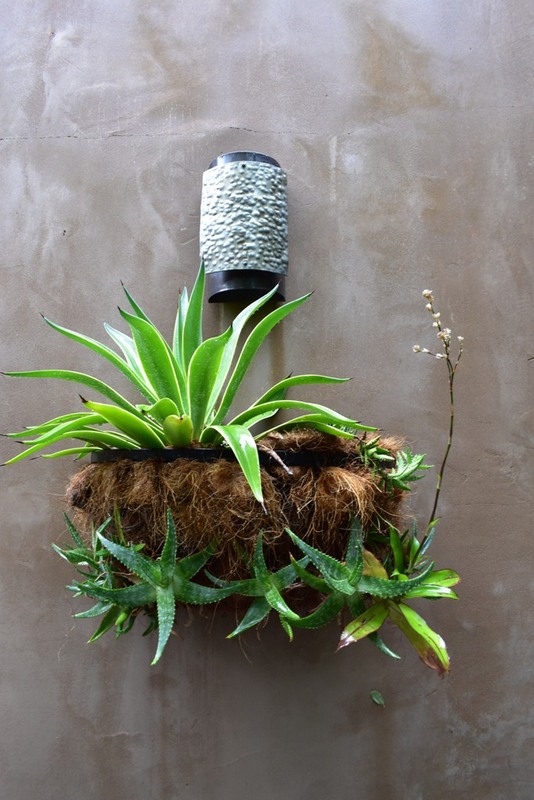 Beargrass or Sacahuista / Nolina texana – the real Nolina texana – softening the oxidized edges. 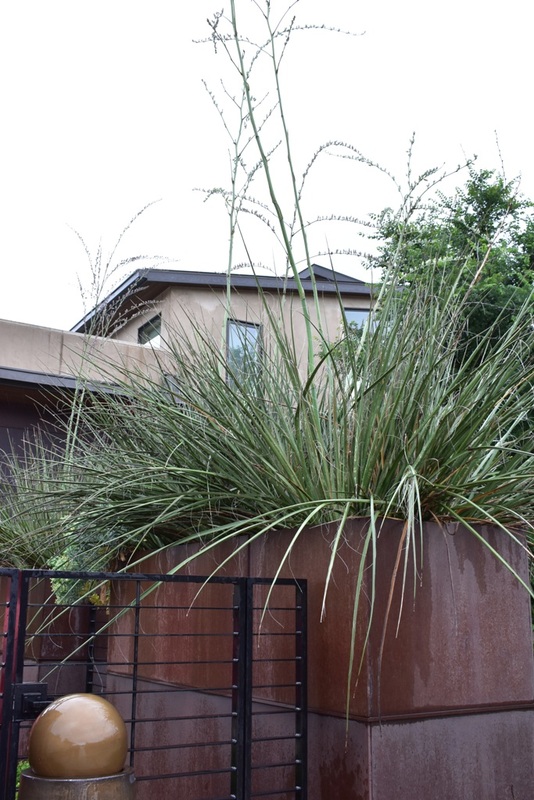 Plant massing and plant punctuation are used well, whether Yucca and Agave, or Taxodium / Bald Cypress and Muhlenbergia capillaris / Gulf Muhly grasses. Green on green. Cream on cream. 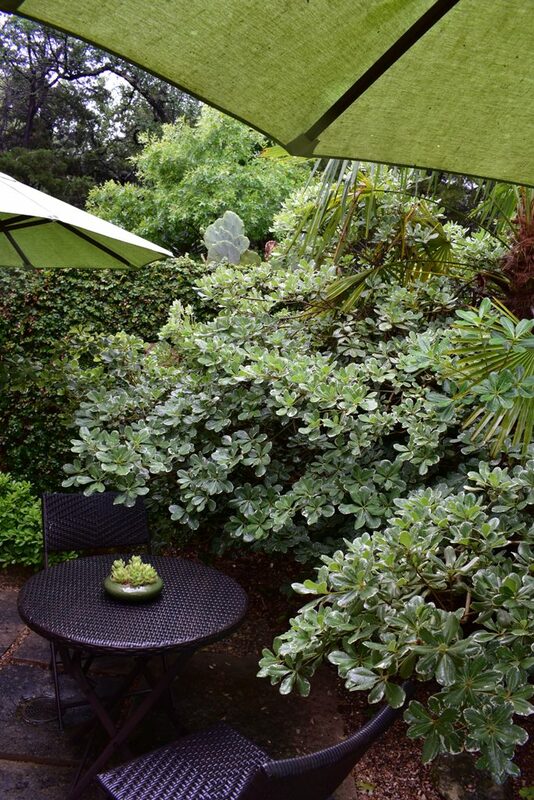 The contrast of wilder plant forms with manicured, clipped Boxwood always gives me enjoyment. I’ll let you ponder why it works. 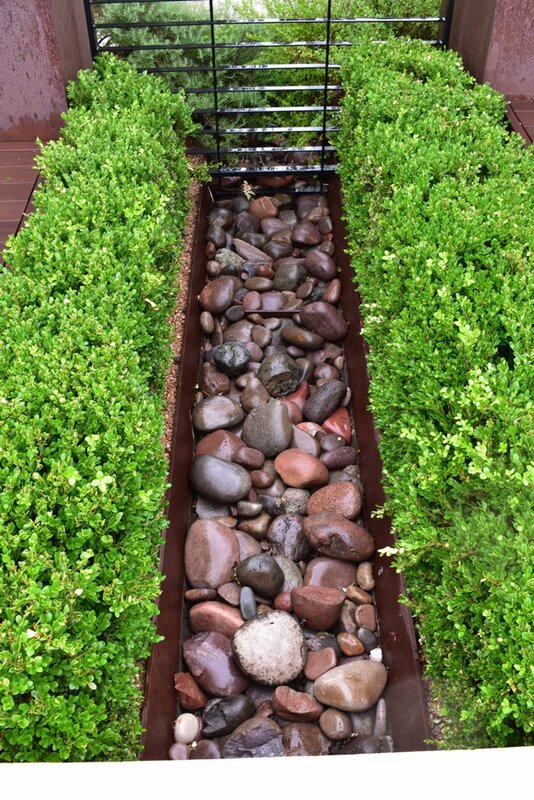 Hint: search garden design principles, and you’ll see and probably come up with even more principles. This is the kind of garden that blows out the repressive perceptions of “native plants aren’t tough to the urban environment like invasives”, “there are no lines in nature”, “I don’t like lists”, “nature doesn’t fit into neat categories”, “formality is so passe”, “you need more flowers”, “I don’t like roses, hedges and lawn”, “oh, you’re into ‘design’ “, or the other silliness. I’ve actually heard that and more from the untrained or unpracticed. We do better. 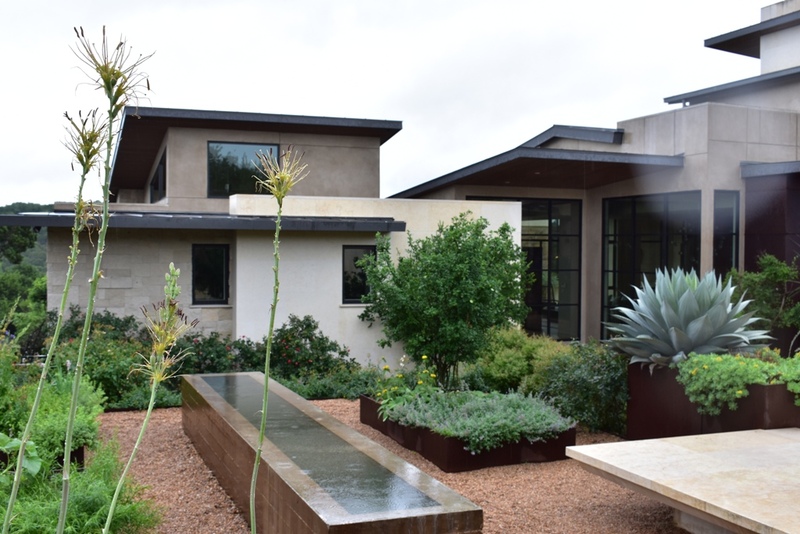 Having met this garden’s landscape architect, and now the owner, this landscape is one rare, harmonious connection between both parties and to the land. Details, details. Forget the devil, there’s greatness in the details! Comfortable, minimal, yet warm and peaceful. Yes, more rain spots on my camera lens prove I could improve my wet weather photog skill set. 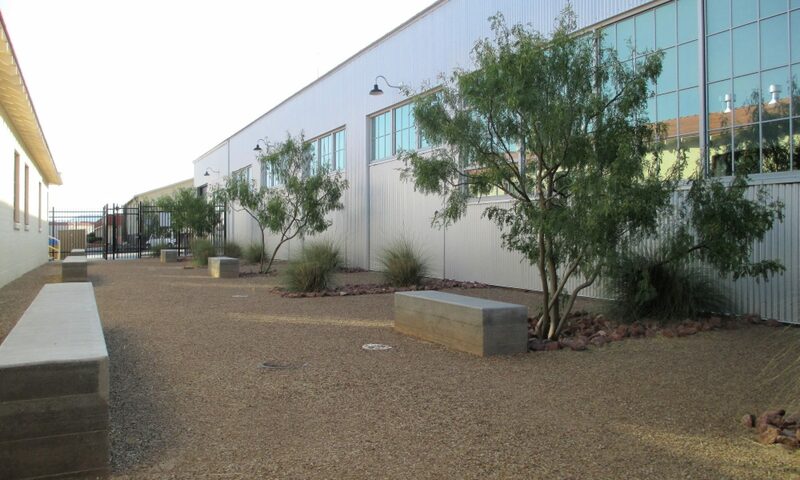 Then in moments, the chairs and patio filled in with tour bus companions, so no more pictures for me in that magic spot. There’s so much movement and energy in this scene, even under the parting weather front’s moisture blanket. Now, imagine this under my desert southwest conditions. Flowers optional, form required for success. 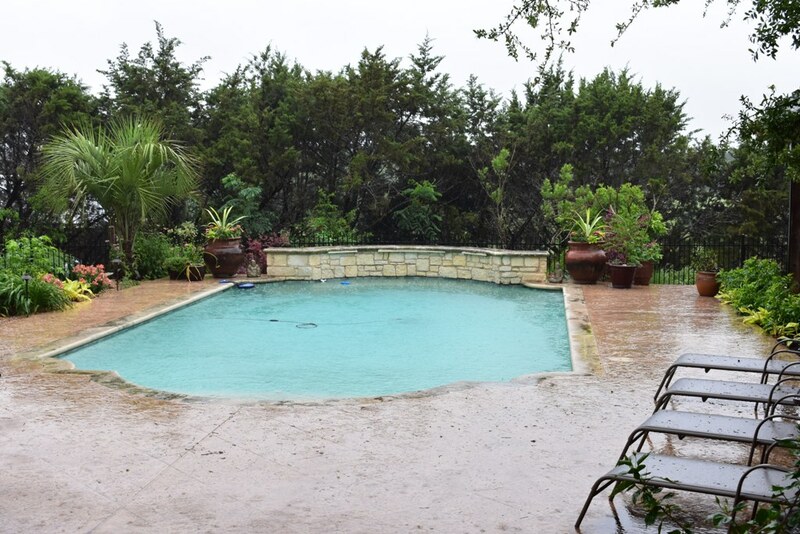 This does that well in Austin, so probably as well where I live, given our .75″ of rain since October. There are only the occasional flowers in my nearby wild areas. Almost dried out and feeling more normal, we arrived at the conference hotel downtown, where I quickly found the way to my car. It was time to visit a colleague working late that Friday with a few coworkers at her office (no surprise), a drink and freshen-up at my lodging while reviewing photos, and then a long-time friend over tapas and [dry] red wine. You really made me wish I was on the tour with you. your insightful comments always concur with what I instinctively feel about each image although I know that isn’t the same as being in the garden. the last garden blew me away. Reminded me a little of the designs of Fernando Caruncho. Then my post worked, and thanks for your sharing that! Yes, being in the garden is the best, but you never know in our small world that may happen someday. 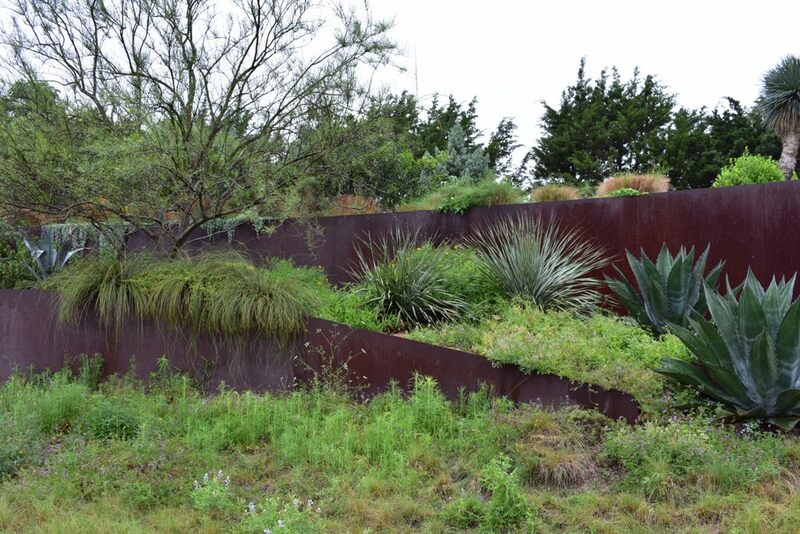 Agreed on the last garden, and thanks for sharing Caruncho – I now am reading through his website! 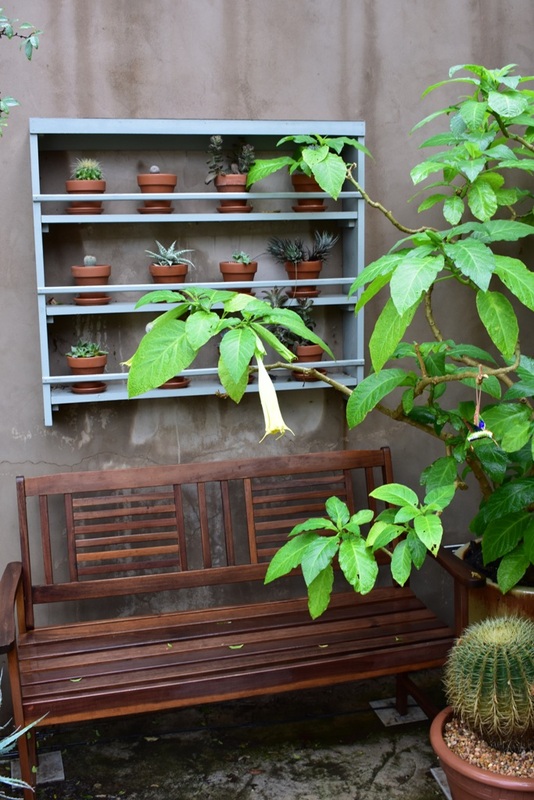 Loved your photos and dialogue and tried not to get too hung up on any flattering comparison between my garden and that of Jennifer and David. So glad you came long for this Fling adventure! 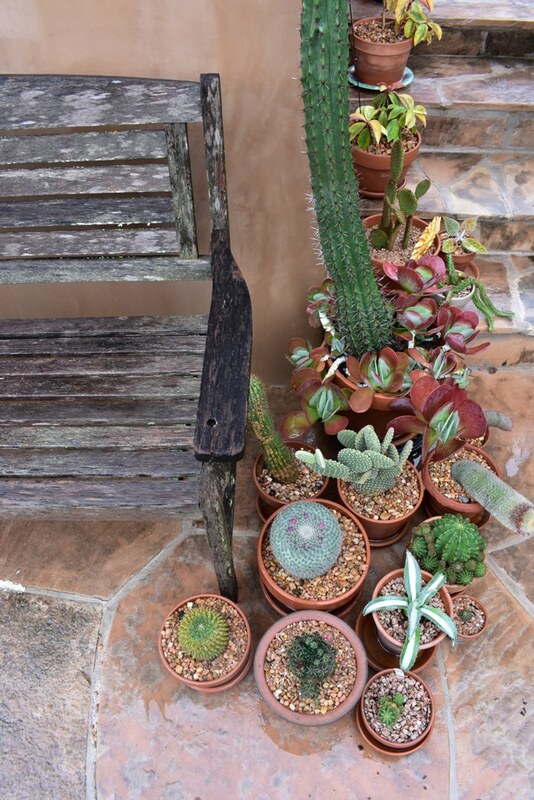 I loved reading your take on the various gardens. 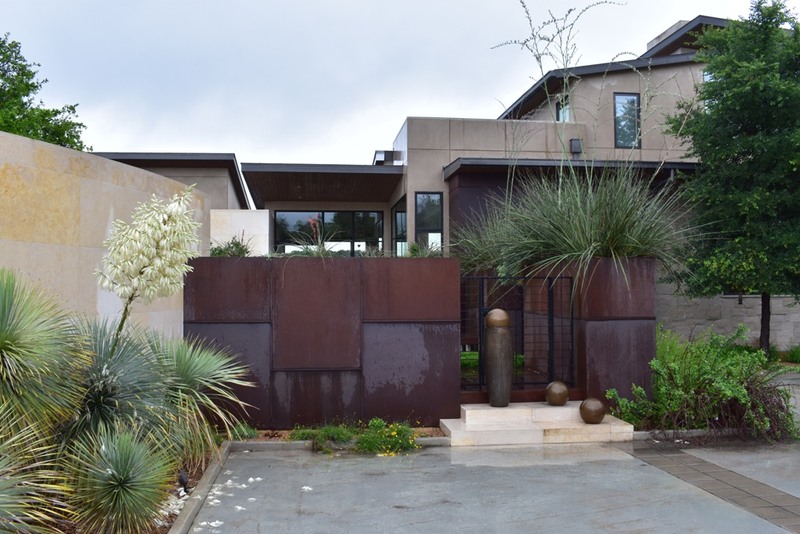 The Mirador garden was such an amazing combination of plants and materials, and the engineer in me loved their gorgeous water collection system! I hung on every word as I read this post and will re-read it later. So much insight (and great photos!) Your images showed me details I didn’t see–always a treasured learning moment. I loved hanging out with you at the Fling. A personal highlight! Very cool, seeing others’ photos and their ideas is half the fun of travelling in a group. I missed so much that others captured. Same here – we’ll meet again I’m sure! 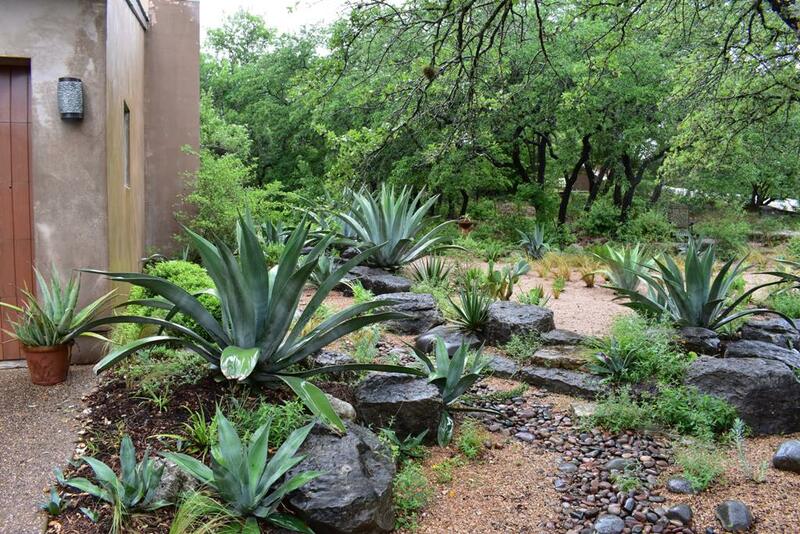 It’s wonderful to read your impressions of the gardens — and the weather — and I esp enjoyed your take on the Mirador Garden. I’ll be sure to share this with the l.a. and the owner. Ha! And to think I was going to post 5-6 photos total and say little. No chance, they were all so well-selected and well-designed. A good take on the first day, fun to see you again and read your views on the gardens we saw. The disclaimer is good since I’d been thinking along the same lines that my photos might appear that I was disinterested which was certainly not the case. Thanks, same here! 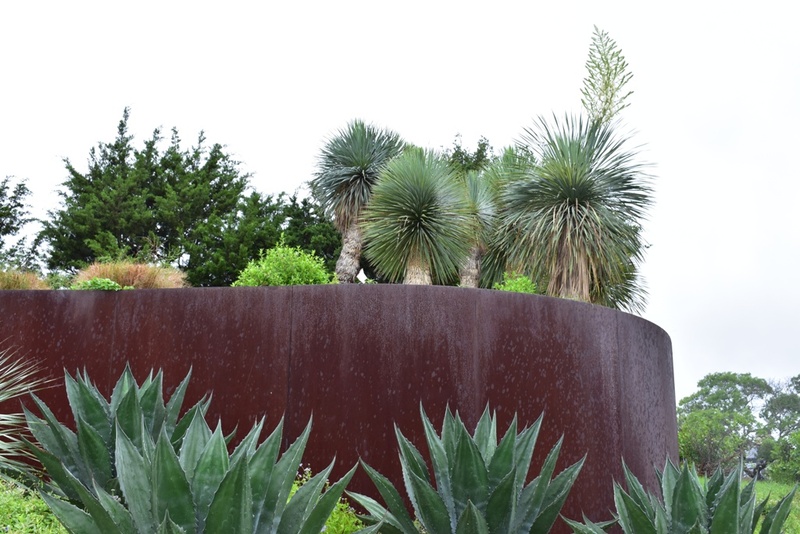 I was impressed at the sheer variety of gardens on the 2 days I attended. So much to re-look at. I decided just in case someone has a bone to pick, though I almost left that out!